Crista McHugh is another one of my favorite-to-go authors and her Kelly Brothers Series is just another beautiful read of siblings from a large family, a wonderful mother and let’s not forget Jasper! 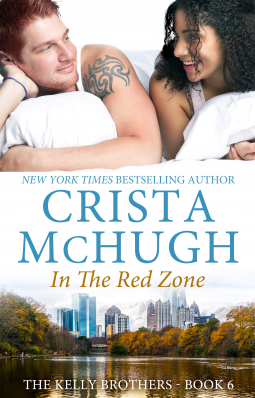 Book 6 in the series, “In The Red Zone” takes us into the world of Frank Kelly and Kiana Dyer, romance and danger, love and racial differences. This is why I love Crista McHugh’s stories. They cover a wide range of social issues from drugs to addictions, from social structure to man-made boundaries, that hinder relationships and her add in her personal experiences and they make some captivating reading. All-star linebacker Frank Kelly may have a hard time controlling his anger and staying out of trouble, but meeting Kiana brings calmness to him that he wants to take to the next level. Kiana Dyer maybe the daughter of a former Hall Of Fame football player, but her father’s dream charity organization needs some serious help and she turns to Frank for help. Frank agrees to help her with his fame and reach, and in return Kiana agrees to date him to help clean up his image. What starts as temporary, leads to instant attraction and Frank wants more permanent than temporary. But Kiana has an abusive and painful past that may end the relationship between them. As secrets come out and Kiana’s life is endangered, Frank is hell bent on protecting her and keeping her with him forever. Courageous and a fighter for her right to life, Kiana warms our hearts as she works hard to make a difference in young children’s lives through her charity. Having everything under the sky, the passionate and protective Frank will even take a bullet to keep the love of his life safe. I love the way he handles Kiana with so much patience, love and support, you can’t help love this Kelly brother. Another great story by Crista McHugh as she weaves another sweet romance around Frank and Kiana, as they struggle to overcome betrayal, insecurities and abuse to hope for a future. Received an ARC from Crista McHugh via NetGalley for an honest review.